The next step is to change our backgorund. We could just fill with a different solid color. In this case, I use a textured pattern with the gray to add a subtle effect that makes the flowers float on top of the background. Dark, neutral colors will bring out the color in the blooms well, but sometimes I like a brighter background to add color to the total image; especially when I am creating a card design. I have also used foliage backgrounds and will do more of that in the future. 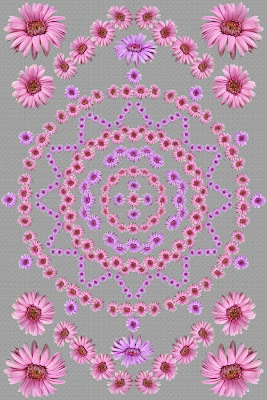 I got a very nice effect with that on my poppy line mandala. You can take a small image of a piece of foliage and tile it to create an almost kaleidoscopic effect. There is plenty of room for you all to add your own approach to all this and to create your own style of flower mandalas. I hope you have as much fun with it as I do.